To say that drug abuse has become a major affliction in society is not an exaggeration; no aspect of life is untouched by this epidemic. Crime and violence are the most obvious byproducts, but amorality, ruined relationships, aborted careers, endangered families and ruined lives are no less serious and just as widespread. Can something be done about it? 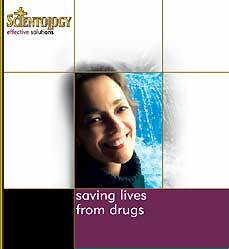 Scientology Effective Solutions: Saving Lives from Drugs brochure, as presented here in its online edition, provides you with important information about what churches of Scientology and their members are doing about the drug problem. This will also introduce you to the most effective solution to drug addiction and dependency – the drug rehabilitation methods developed by humanitarian L. Ron Hubbard. Scientology Effective Solutions: Saving Lives from Drugs also introduces our international drug prevention campaigns that are reducing drug use among the young with community initiatives, lectures and events, and distribution of millions of drug education booklets. It describes the successful drug rehabilitation program – Narconon – dedicated to saving lives from drugs for more than three decades; now with 143 drug rehabilitation and education centers in 37 countries. And finally, we describe the effective detoxification programs freeing those caught in the trap of toxic poisoning or environmental contamination. Provided as a public service, this brochure is the second in a series of 12 we are publishing and putting online through the year, designed to fill the demand for more information about Scientology and its effective solutions. We trust the information will be interesting – and of use. We welcome your comments, questions or requests for copies of the brochure.